Famine, drought and conflict have left millions of people needing food, water and healthcare in East Africa. The UN says that in the last few months, tens of thousands of Somalis have died of causes related to malnutrition. Most of them were children. Very poor rainfall in the region (which includes Somalia, Kenya, Djibouti, Ethiopia and Uganda) has led to the driest period in 60 years for some areas, leading to crop failures and deaths of livestock. High and increasing staple food prices, as well as regional conflict, are combining with the weather to make a bad situation even worse. The rate of refugees from Somalia arriving in southern Ethiopia has increased from 5,000 a month to more than 30,000 in the second week in June. Almost half the children arriving in Ethiopia from Somalia are malnourished. The Red Cross has already acted early to mitigate the impact of drought in the region, but it is now in an extreme situation where they urgently need more funds to address emergency needs. The East Africa Food Crisis Appeal will cover numerous countries including those currently affected and those potentially affected in the future. Money raised will go to support the work of the International Red Cross and Red Crescent Movement in the region, both providing emergency relief and helping people recover their livelihoods. 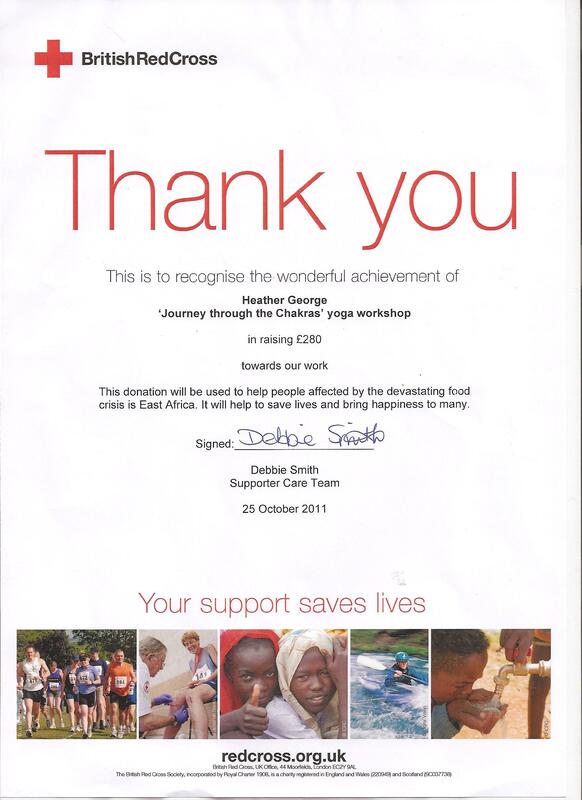 Heather ran her ever popular Journey Through the Chakras workshop to raise money for the East Africa Food Crisis Appeal at River Bourne Health Club which raised £280.